Djaj a riz has become something of a signature dish for me. Generally it is made for special occasions but, as I always insist, every meal is a special occasion! 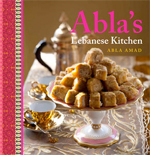 While on a visit to Melbourne more than thirty years ago, an old friend of mine, Barbara, who used to cook for many prominent people in Beirut, showed me the latest trend in presenting the dish in Lebanon. She rummaged through my cupboards for a bowl and instead happened upon a cake tin. In time, I made a slight variation by choosing a tin with a hollow centre, but ever since that day I haven’t wavered from creating my chicken and rice dish in a cake tin. Another way of serving this is to put the lamb and rice mixture on a serving dish and cover it with the chicken. Top with the slivered almonds and pine nuts, and finish with a dusting of ground cinnamon. Place the chicken breasts in a large saucepan and cover with water. Add the cinnamon stick and 1 teaspoon of the salt and bring to the boil, then reduce the heat to low and simmer, covered, for 20-30 minutes or until tender and cooked through. Drain, reserving the stock. Remove the skin and tear the meat from the bone (the chicken slivers can be any size). Set aside. Cook the minced lamb in a saucepan in its own juices over medium heat for about 10 minutes, mashing with a wooden spoon to separate any lumps and stirring regularly to avoid sticking. Stir in the butter, spices and the remaining salt. Cover and cook for 20 minutes or until well done, stirring regularly to prevent lumps forming. Add the rice and 2 1/2 cups (625ml) of the reserved chicken stock, then cover and cook for a further 20 minutes. Heat a little olive oil in a frying pan and cook the pine nuts and almonds over medium heat for 3-4 minutes or until golden, stirring constantly to prevent burning. Remove the nuts with a slotted spoon and drain on a paper towel. To assemble, spread the almonds and pine nuts over the base of a round 25 cm cake tin with a hollow centre. Pack the shredded chicken around the outer edge of the mould. Fill with the lamb and rice mixture, pressing down firmly and ensuring the chicken remains in place. To serve, put a serving plate face down over the mould and invert the chicken and rice onto it. Gently remove the mould and sprinkle a little extra cinnamon over the top.